Find the best 7 day tours and trips starting from Canggu. Choose from 6 tours - we've found the most popular time to visit is in May with the most number of tour departures. "I would fully recommend the 6-day island hopper surf tour organised by Mojosurf...."
"We had a great time surfing with mojosurf. Great teachers, got to know everyone so..."
"16days ultimate trip. The best trip ever! Awesome people and heaps of good waves!..." "Had an amazing week surfing with Mojo surf in Bali. 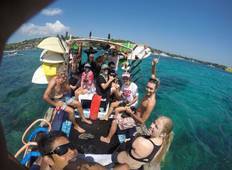 We surfed Bali, Lombok and Nusa..."
"I would definitely recommend this trip. It was relaxed with enough free time and..."